It could generate more revenue than we know what to do with—not a bad problem to have. 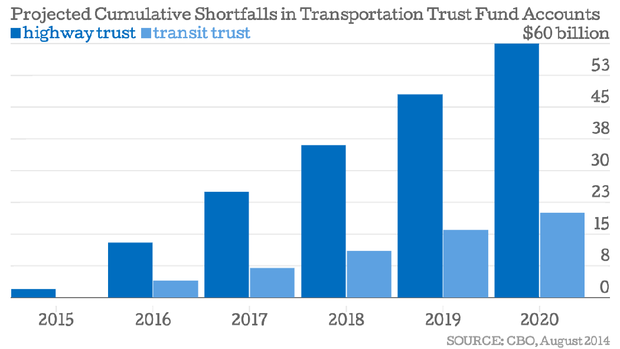 The Highway Trust Fund that pays for America's roads narrowly avoided bankruptcy this summer, but it's already in trouble again. In August, after the latest budget patch was approved, the Congressional Budget Office estimated that the fund would run out of money again—next year. At the current rate, the highway account will be $60 billion in the hole (and the transit account another $20 billion down) by 2020. Sure, we can count on additional emergency patches here or there, but this trajectory is the definition of an unsustainable one. With that we turn to an exhaustive new menu of funding options presented by the American Association of State Highway and Transportation Officials (AASHTO), which evaluates a number of long-term possibilities primarily on revenue potential. The options include existing revenue mechanisms, like the troubled gas tax, updated for necessary rate increases. It also includes a whole bunch of options should Congress move to replace the current ones. Let's take a closer look at a few of ideas with the greatest earning potential. First and foremost is a simple increase to the current gas tax, which has been at 18.4 cents a gallon since 1993. An AASHTO scenario that raises the tax 10 cents would yield $13.21 billion in 2014 and $78.12 billion by 2020—just about covering the $80 billion deficit expected by the CBO. If you add in a new diesel gas tax of 15 extra cents a gallon, generating $41.79 billion by 2020, the current budget projections would be on solid grounds. Of course, if fixing the Highway Trust Fund were as simple as raising the gas tax—or even just indexing it to inflation—we would have done that by now. Though the burden is minimal (less than $5 a month for most drivers) and the current rates laughable (New Jersey drivers, for instance, pay about what they did in 1927), most public officials refuse even to entertain the idea of raising the tax. Childish intransigence aside, the gas tax isn't perfect: its reliability as a long-term fix is questionable given improvements in fuel efficiency and broad declines in driving. Some of the other strong options from a revenue standpoint include a sales tax on gasoline and a dedicated part of income taxes. A gas sales tax (which evidently differs from the existing fuel tax, an excise tax) would generate a hefty $155.66 billion by 2020. But sales taxes are also regressive, falling harder on the poor, and there's little reason to believe officials would choose this route over raising the existing gas tax. Dedicating 5 percent of personal income taxes to transportation is a progressive way to spend public money, but it would only generate $43.36 billion by 2020. Which brings us to the top potential earner by far on the AASHTO list: A mileage-based driving fee. 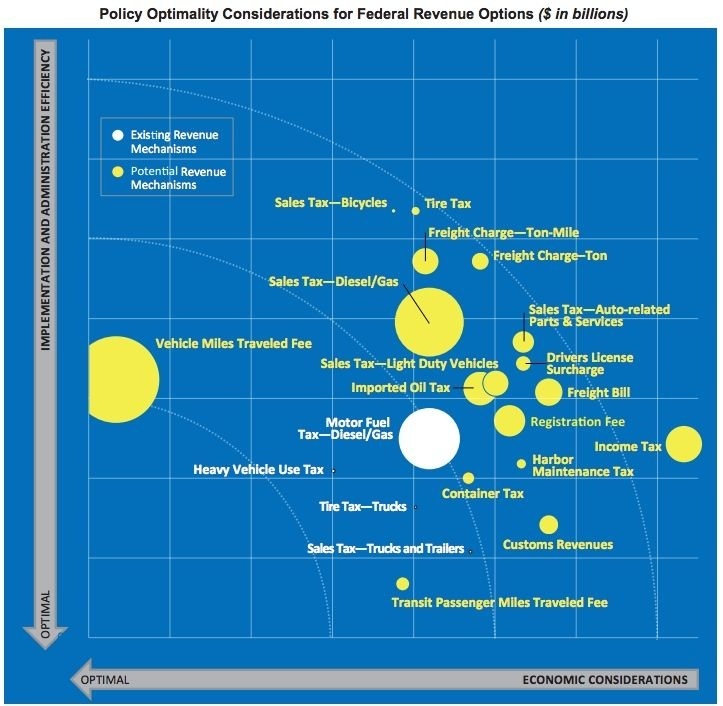 A penny a mile tax on typical passenger vehicles would generate $175.58 billion by 2020. Meanwhile, a four-cent-a-mile fee on trucks, which cause more damage to roads, would bring in another $70.73 over that same period. Altogether a mileage-based driving fee would produce an astonishing $246.31 billion by 2020. Nearly $250 billion by 2020 is enough to cover the Highway Trust Fund many times over. It's also enough to make a huge dent in America's maintenance deficit, with money left over to consider a true national infrastructure program for the 21st century—be it high-speed rail or broadband Internet. Oregon has successfully tested a non-GPS option in its local pilot program (and besides, your in-car navigation system is already watching you). Sure, some drivers would pay more in the new system than they do now, but others would pay less, and household fuel costs would decline without the gas tax. At the end of the day, a mileage-based system offers the most direct connection between using roads and paying for them. There are some drawbacks, too. With so much money on hand, lawmakers might be tempted to build more roads than necessary rather than fix existing ones, creating new maintenance costs that drag on taxpayers for years. It's not clear how accurate the long-term revenue projects would be given that America seems to have reached peak driving. Metro areas will have to provide better transit service in some highway corridors to satisfy equity concerns. But these are problems officials already face to some extent—better to face them with more money than less. The tide already seems to have turned at the state level. California recently became the latest state to embrace a mileage-fee program, passing a law that will implement a pilot program by 2017. Oregon's own pilot program, the country's leading effort, will soon enter its next phase of development, recruiting 5,000 test drivers. It's not too soon for the federal government to set up a trial of its own, ideally in its next transportation funding bill. The AASHTO numbers suggest several reasons (billions, in fact) to give a mileage system try. The only thing we have to lose is a system that's already broken.